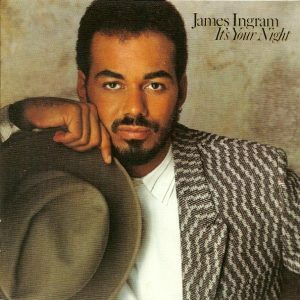 Just a few days after the legendary Michel Legrand left this earth, we have lost James Ingram who graced the Quincy Jones album “The Dude”, one of the best albums ever, with the two gorgeous ballads “Just Once” (written by Barry Mann and Cynthia Weill) and “One Hundred Ways” (written by Kathy Wakefield, Ben Wright and Tony Coleman) along with the still-classy title track (writtten by Rod Temperton, Quincy Jones and Patti Austin). And it was Patti Austin‘s Number One hit “Baby Come To Me” where he performed one of his strongest vocals ever. After his glorious debut album “It’s Your Night” (1983) which featured the intoxicating “Yah Mo Be There” with Michael McDonald and an interpretation of Michel Legrand‘s “How Do You Keep The Music Playing?”, he released several more albums, but none of which really ignited even though there were some brilliant tunes to be found there (I have added his take on the Thom Bell beauty “A Baby’s Born” from his 1993 album “Always You” to my Spotify playlist). Since he became a much sought-after duet partner and singer for soundtrack scores, James added a lot of legendary singers to his resume having worked with Nancy Wilson (“Wish You Were Here”), Dolly Parton (“The Day I Fell In Love”), Linda Ronstadt (“Somewhere Out There”) and of course Patti Austin (“How Do You Keep The Music Playing?”), among many others. His signature voice could be as roaring and strong like a Teddy Pendergrass and as passionate and subtle like a Johnny Mathis. The work on the Quincy Jones album was nominated for a Grammy even though he didn’t have a record out under his own name. He has also worked with Ray Charles and Ernie Watts and since work with Q always opens doors, he co-wrote Michael Jackson‘s “P.Y.T.” But he wasn’t a total newcomer before Mister Jones entered his world. He played keyboards and synths on several records like Carl Carlton’s “She’s A Bad Mama Jamma” or Leon Haywood’s disco classic “Don’t Push It, Don’t Force It” and in 1982, on Shalamar’s epic “A Night To Remember”. James wasn’t only known for the wonderful pop balladeering, but also for the real soul and house. In 2001, he collaborated with the Masters At Work guys Louie Vega and Kenny “Dope” Gonzalez and co-wrote the deep and thick house track “Lean On Me” with fantastic backing vocals by Patti Austin and Jocelyn Brown. On the 10-minute flashy MAW mix (which was an essential part of my DJ sets for a longer stretch of time) and the equally entrancing remix by Matthias “Matty” Heilbronn, James not only plays a mean and funky and dirty B3 organ solo, but also shows his uncanny knack to cross over to the dancefloor without losing his exceptional trademark – his voice.